Necessity is the mother of invention,and few things have propelled human advancement more than harnessing the power of fire. Take the next step with Tesla Coil Lighters in hand - the modern day solution to traditional lighters,because who has time to fuss with butane,wait for a flame,or fumble with spark wheels? Forge your way into the future alongside Tesla Coil Lighters,where we light the way with innovative electric lighters designed for the modern world. Our electric lighters are simple to use,safe,reliable,flameless and therefore truly windproof,with sleek and sophisticated designs that are sure to catch the eye and spark conversation. Take charge with the Arc Lighter from Tesla Coil Lighters,a rechargeable electric lighter that requires no flame,no butane,and no hassle! This innovative lighter works by creating an electric arc with one press of a button. Simply charge up via USB and you're ready to go - Anytime,anywhere. Since the lighter uses no flame,it is not only windproof,but also economical and environmentally friendly. No more lighter fluid refills or throwing out those cheap plastic lighters! The lighter also has a safety feature,so it will not light up when the lid is closed. Stash it in your bag or pocket and delight in the freedom to take the Tesla Coil Lighter anywhere,without worries. 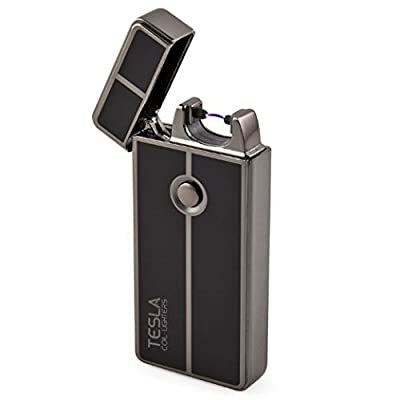 WARRANTY - Your Tesla Coil Lighter comes standard with a 1-year manufacturer's warranty which only covers manufacturer defects and does not apply to wear and tear from normal usage,misuse,mishandling,or unapproved modifications. For warranty service,please contact your authorized seller. DISCLAIMER -Tesla Coil Lighters and its agents will not be held responsible for any and all liability related to improper or unintended use or modification of the product. The purchaser,user,or participant assumes all risk of injury from any use.